If you didn’t make the club’s meeting at the University of Southern Maine Saturday night 1/20 you missed out. Doug Rogers offered up a taste of the islands secrets to our lucky club members in attendance, including two take home artifact specimens for two happy club members. Doug worked for Pan American’s Aerospace Division from 1966 to 1971 and returned to the island (a costly and regulated endeavor) in 1997 and 2016. 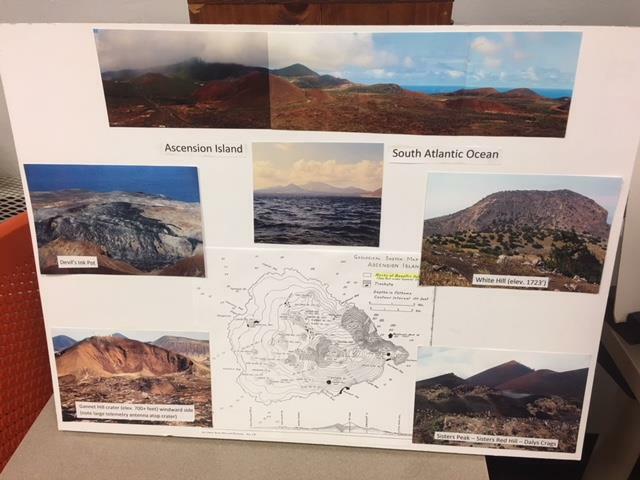 The governmental website provides details about the island and what’s involved with a visit http://www.ascension-island.gov.ac/ . However, there’s nothing like a hands on presentation and Doug didn’t disappoint. He’s even sought after by island inhabitants as a tour guide due to his first-hand knowledge of its archeology, history and landscape, go figure.